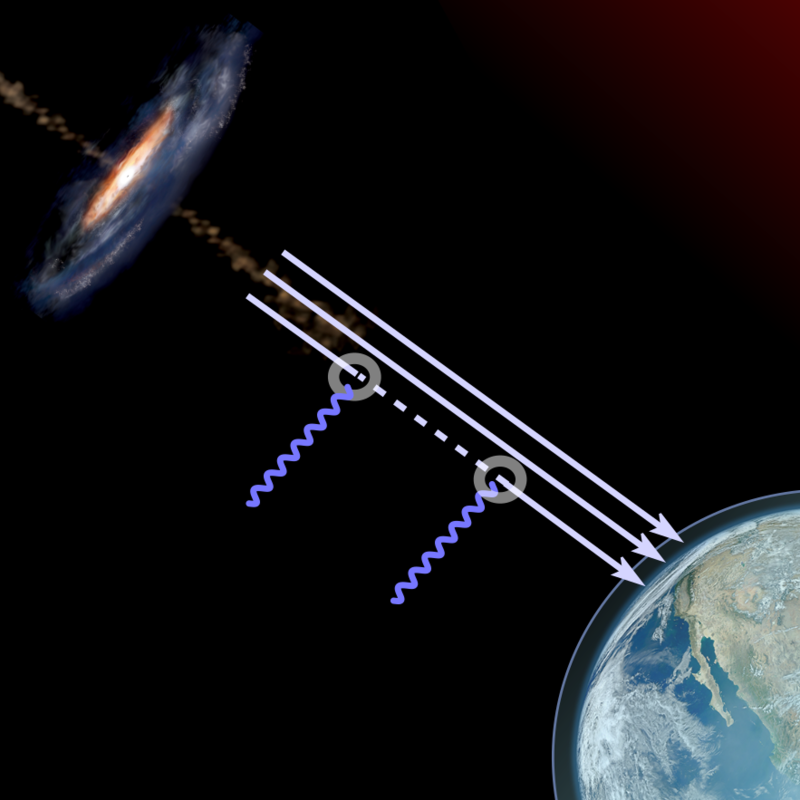 Physicists around the globe are working relentlessly to pin down the nature of dark matter. This enigmatic entity hides itself from our view as it does neither emit nor absorb any radiation. It only reveals itself through its gravitational interaction. With a new analysis of data from NASA’s gamma-ray large area telescope (LAT) on board the Fermi satellite, we have now come closer to test very light dark matter candidates. Many regard the astrophysical evidence for dark matter as evidence for yet undiscovered fundamental particles. Well-motivated theories suggest that these particles should be quite heavy, probably a couple of dozen times as massive as the proton. If so, either their decay or the annihilation of two such particles could result in energetic light: gamma-ray emission that we could detect with the LAT. Also the LHC and direct detection experiments such as the recently inaugurated Xenon 1T are looking for traces of heavy dark-matter candidates. However, dark-matter particles could also be extremely light, more than five hundred billion times lighter than the electron. They are often referred to as axion-like particles (ALPs). They are close relatives to the axion which was originally proposed in the late 70s to solve problem in the strong interactions. It was soon realized that this class of particles could also constitute the dark matter. Unfortunately, very light ALPs have lifetimes much longer than the age of the Universe and do not obliterate each other upon meeting. However, there’s a small chance that ALPs transform into ordinary light (and vice versa) in the presence of a magnetic field. This leads to oscillations between light and ALPs very much like neutrino oscillations. Illustration of the photon-axionlike particle conversion: Light produced in the jet of the galaxy converts into ALPs (dashed lines) and vice-versa when interacting with the magnetic field (wiggled line). Credits: Aurore Simonnet, Sonoma State University and NASA/NOAA/GSFC/Suomi NPP/VIIRS/Norman Kuring. We have used Fermi-LAT observations of an extremely bright gamma-ray source to search for traces of these oscillations: the central galaxy of the Perseus galaxy cluster. In its center, a spinning super-massive black hole powers a current stream of plasma that emits gamma-ray radiation. When the gamma rays propagate through the magnetic field present in the gas between the galaxies of the cluster, they could transform into ALPs and imprint distortions onto the galaxy’s spectrum. We did not find any such features above the level of statistical fluctuations which enabled us to rule out ALP models that would contribute sub-dominantly to the overall dark-matter content. These are best constraints in the particular ALP mass region to date. Our limits turned out to be as sensitive as as the future “Any Light Particle Searches” (ALPS) experiment. In the ALPS experiment, it is planned to shoot a powerful laser beam immersed in a magnetic field onto a wall and look for light that might have made it through it in the form of ALPs. Our analysis only marks the beginning for ALP searches with the Fermi-LAT. With the analysis of more sources we will be sensitive enough to probe ALPs that could make up all the dark matter in the Universe. 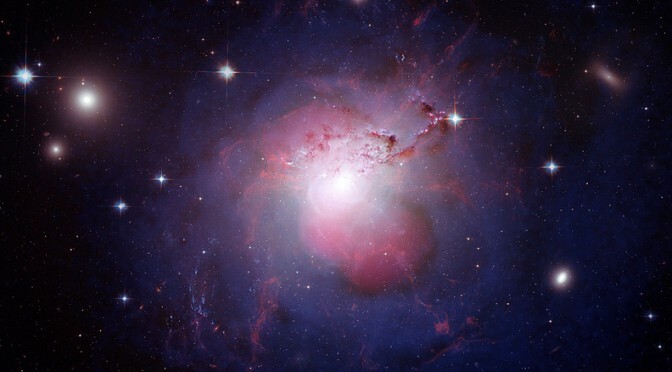 Caption for the picture in the cover: Composite image of the central galaxy in the Perseus cluster taken with the Hubble space telescope and the Chandra X-ray satellite. Previous PostATLAS Thesis Award goes to the Dark SideNext PostElectromagnetic Counterparts to Black Hole Mergers?